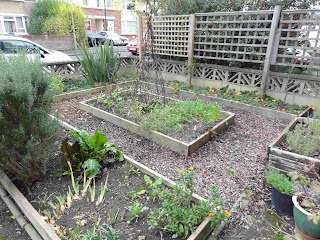 For 2012 I am going to blog about my front garden on the 1st day of each month. I'll follow how it changes over the year, how much food I can produce from the space, and how my development plans are progressing. 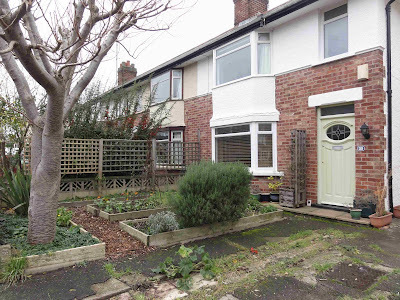 I redesigned the front garden in 2010. 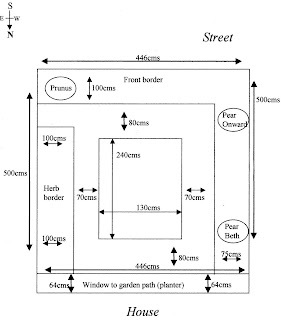 It is a space of 5m x 4.46m and when we moved in January 2009, it was just a square with various plants haphazardly dotted around, with no paths and no clear idea of what the previous owner was trying to do; or maybe they weren't trying to do anything? You can read about the initial redesign and see how it originally looked in my post from April 2010. The new design has raised beds made from recycled scaffold boards obtained from building sites, and paths with permeable membrane and wood chips on top. 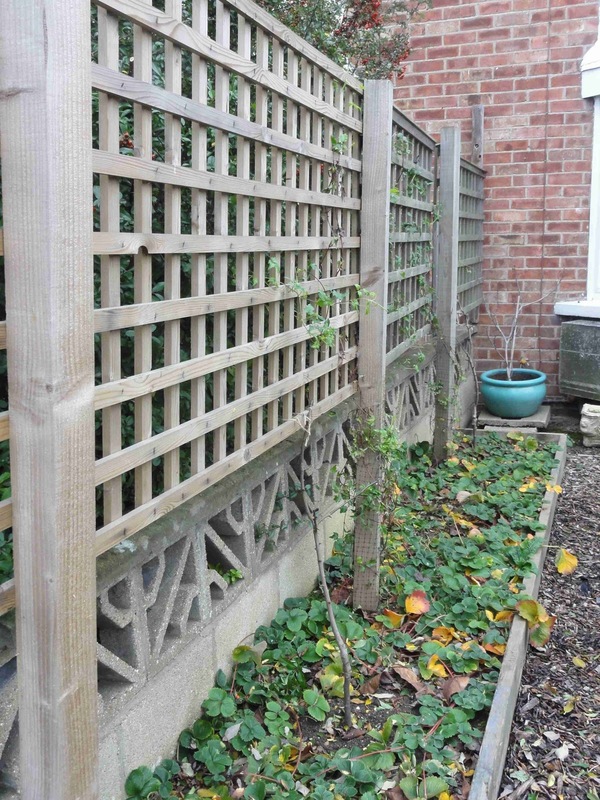 This gives it an attractive look and makes it also easily accessible for doing weeding, planting and harvesting. 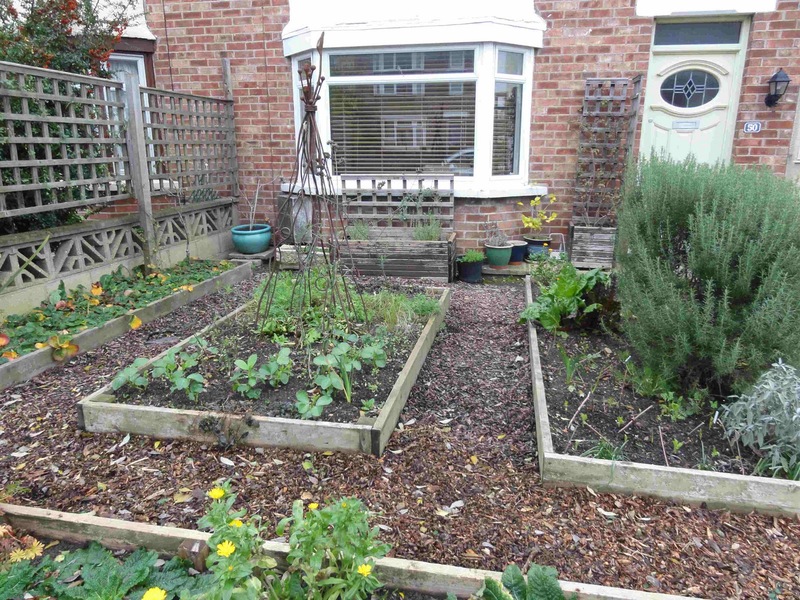 My overall aim for the front garden, which is based on permaculture principles, is to find a balance between obtaining fruit and vegetable yields, maximising output from a small but south-facing space, whilst including perennials and bulbs, raised beds and clear paths, to help give it some structure and make it attractive all year round. The front garden is almost full south facing. The path/driveway leading to the front door (above) is a mix of asphalt and paving stones, all of which is breaking up and in poor condition. 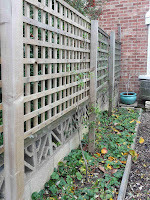 Although I have plans for this area to get rid of the eyesore and create a lovely path and beds, this is for the future. It's a big job and we need to get a new roof for the house this year! Gardening, sadly, doesn't always come first... In the meantime, last year I let the self sown flowers take over a bit (i.e. hollyhocks & primulas) and personally found this more pleasant that the asphalt, even if it did look a little wild, so will leave it to do the same this year. It is shaded on the west side by my neighbours, Fung and Simon's, front gardens trees and shrubs. These are kept largely under control, mutually agreed by myself and Fung and Simon, but do still mean that the west side does get shade in the late afternoon. I have planted two pear trees here and an am training them as espaliers. 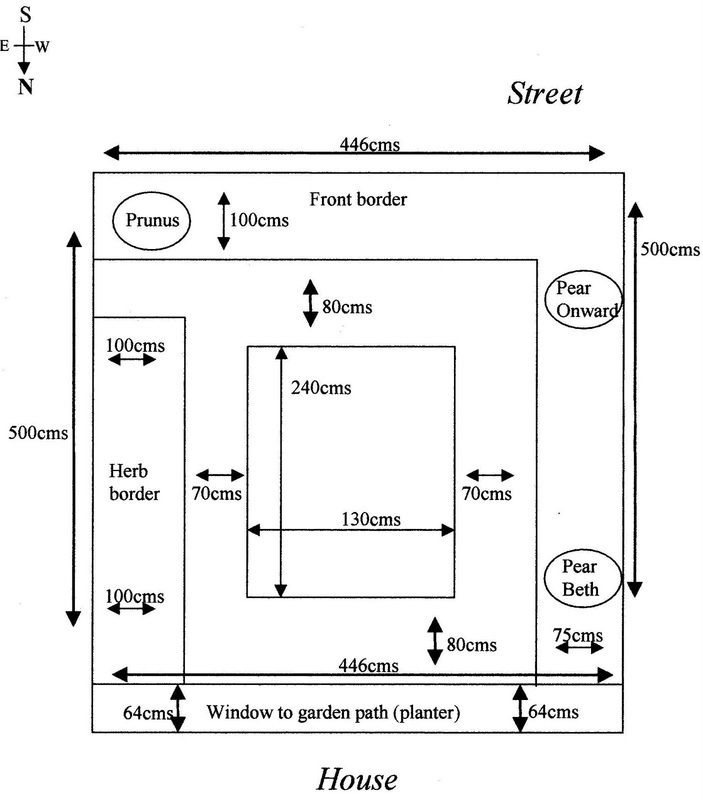 They are only 3 years only and in 2010 I started training the first espalier level on both. I think it will be hard for your to spot them in the photos; you can see 'Onward', just, between the first and 2nd posts. Underneath they are planted with strawberries, as I'm want to maximise the yield from that part of the garden, using forest garden principles. We got a good crop of strawberries from here last summer, so the later afternoon shade doesn't effect the yields coming from the strawberries. I've also under planted the pear trees with a few perennials and spring bulbs, and added winter flowering clematis, Clematis Cirrhosa Freckles and Clematis Cirrhosa Ourika Valley to grow up the trellis so this will be prettier in coming winters (I hope!). The rest of the front garden can get shade from the large flowering Prunus (on the left of the top photo). We have been pruning it heavily over the last two summers. It's been problematic as it was allowed to grow way too large for the space prior to us moving in, but is beautiful in flower and in autumn. I'm loathe to take it out, as it would be a massive job and expensive, and we do get the yield of small branches from prunings that we dry out and use for kindling. However, I am thinking it over, as I have been considering whether to remove both the Prunus and the ugly concrete fence on the street side, and plant a hazel nut hedge in it's place. The hazel nut hedge would act as the new 'fence' but also give me a yield in nuts; if I can beat the squirrels to them of course! In the same bed as the Prunus is a Phormium, which I'm not keen on and definitely want to get rid of. It's only staying there until I decided what to do with this border. In the meantime, I have added annuals (teasels) and perennials (heleniums) and some more bulbs to accompany the vinca minor that was already there. It's pretty but a bit of a brute and I found when I grew broad beans in this bed in 2010, that the vinca tried to smother them. So yes, this border definitely needs some rethinking. The central bed has an obelisk that is beautiful and gives interest even in mid winter. So far I've grown a mix of vegetables (tomatoes and broad beans in 2010, both very successful with excellent yields, plus green manure) amongst annuals, perennials and bulbs. In 2012, the front half of the bed has broad beans and garlic. The back half currently has green manure, and perennial kale will be added late spring. I'll grow some heritage beans that will crop mid summer, up the obelisk, which is also under planted with heleniums that will take over from mid-summer onwards. The bed next to the asphalt path (to the right in the photograph below) currently has rosemary, sage and irises and a mix of calendula, crocuses and muscari around the edges. 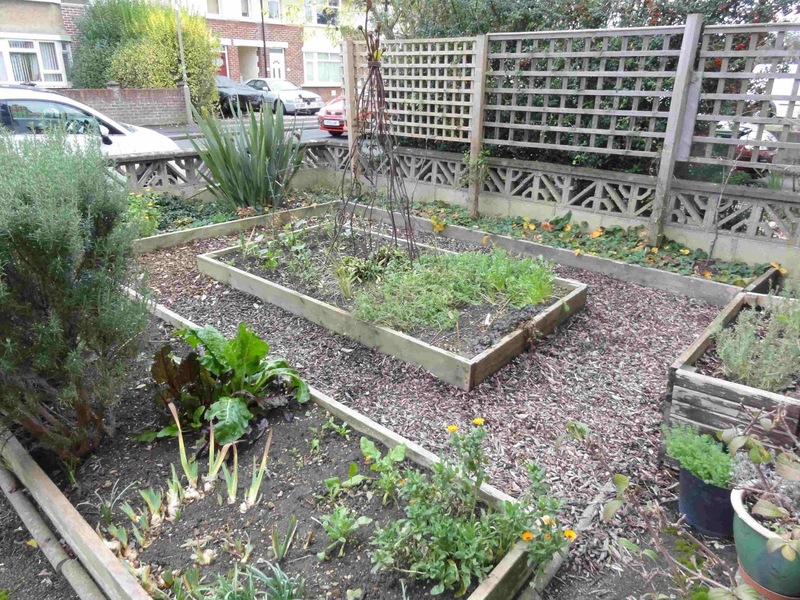 In 2011 I used it to also grow a mix of beetroot, chard and spinach. I have planted autumn-sown broad beans for 2012, and will also add tomatoes in May. There are also a few containers and planters in the front garden. The big blue pot on the left has a fig, which I am going to pass on. I brought it from our previous house in Witney in 2009, but don't need it as I have a large fruiting one we inherited in the back garden. I'm thinking of putting in a lemon tree in it's place. I thought a lemon tree might do well in this position, as with the south-facing warm brick wall of the house, it should have a slightly warmer and protected micro-climate. The large planter in front of the bay window has lavender and geranium phaeum, and I will add some sweet peas and nasturtium as I did in 2011. I have tried growing veg in the planter, but it gets so hot and dry that even with constant watering and feeding the yields weren't particularly good. So I planted it up with flowers and shrubs instead, and will concentrate my food yields in the raised beds. So now, on with the year! Me too. And I sowed my first lettuce yesterday too!